I’m sitting here in a spider man sweatshirt with holes in it, eating low-fat pringles, about to watch “Housewives”. I am anything but “elegant”, but for some reason my decorating always goes back to a little “fancy”. Why is that, you guys??? I guess we will never truly know why we love what we love, will we? All we can do is just keep lovin’ it 😉 . 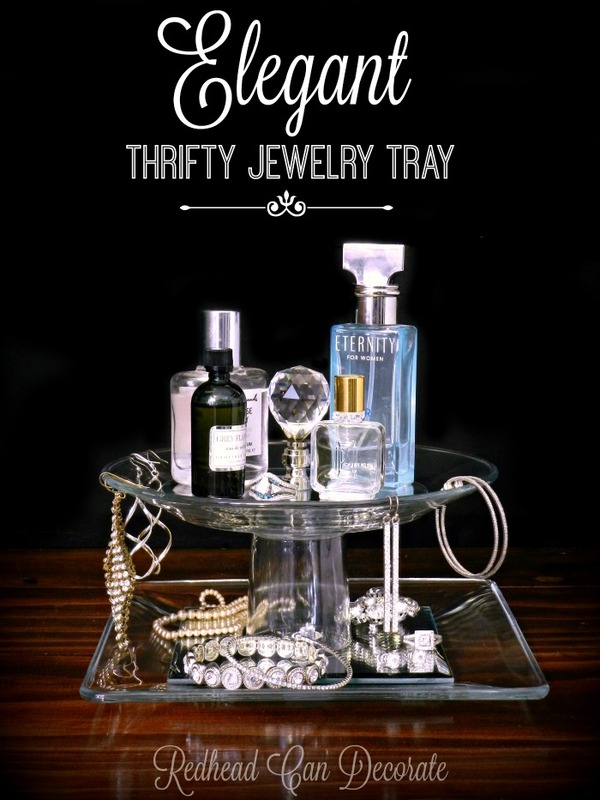 That brings me to this month’s “Thrifty Style Team’s” topic-my new “Elegant Thrifty Jewelry Tray” that now rests in my powder room bathroom next to the rest of my “stuff”. After you take a look, please check out my girls below from the Thrifty Style Team and all of their affordable ideas. We all make such a great team. Don’t let the staged photos fool you now. This baby is not only good looking and elegant, she also makes a mighty catch-all. After a long hard day taking care of everyone and everything I can whip off my jewels and know that they are safe here. I also noticed that it’s perfect for some of my perfume bottles. Okay, no, I do not wear Grey Flannel, but Rick sometimes does 😯 . 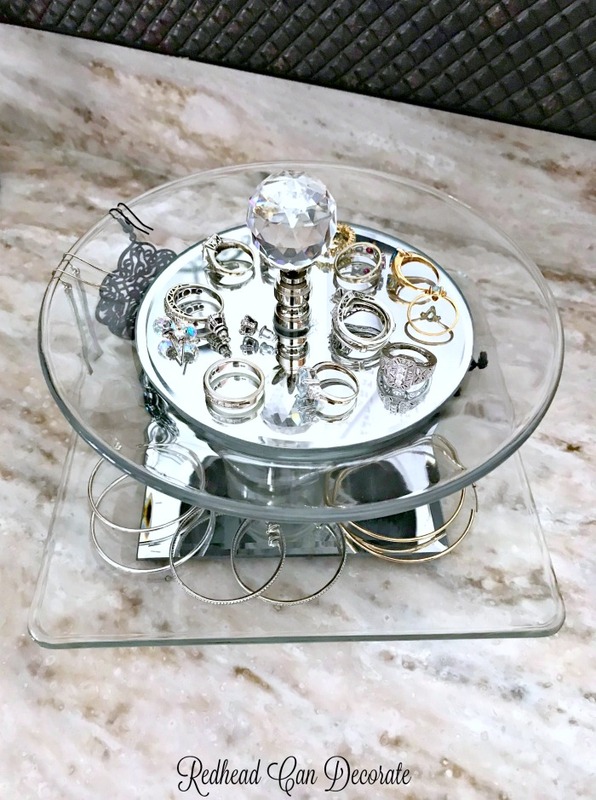 Notice how I can hang my hoops, protect a ring in the “glass center” like Indiana Jones is stopping by, and the best part is that I can lift the top tier up with the “crystal handle”. So cool! 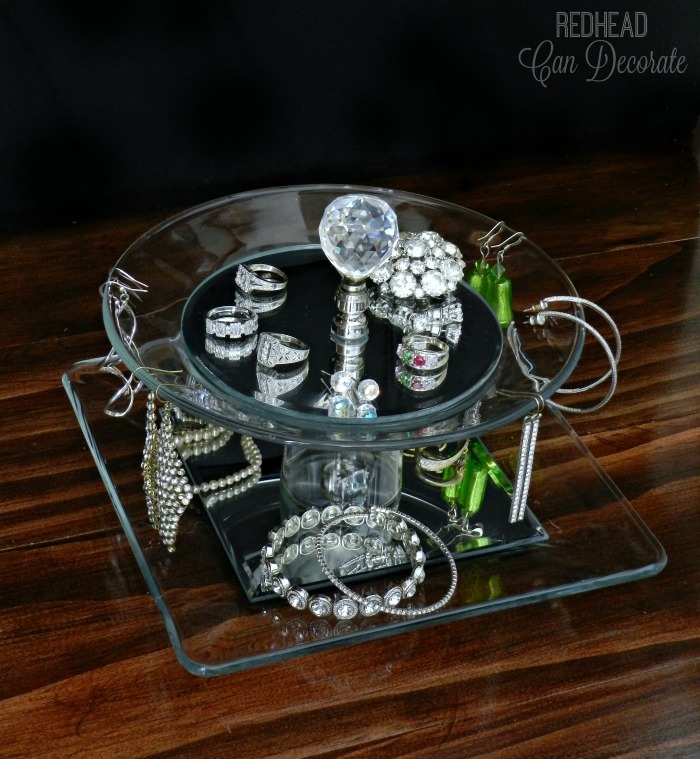 It would also make a sweet make-up tray, or hold your glasses.. This is what it looks like on my vanity right now. I noticed after 30 years together your ring collection really grows 😯 . *** Some of the links in this post may contain affiliate links for your convenience. Read full disclosure policy here. Glue bottom of votive candle holder to bottom of round plate and flip over to dry. Glue mirrors on both plates. Glue finial in middle of round mirror. Put it all together as shown. It is so elegant, Julie! Great little organizer! I was shocked at how pretty it turned out. Thanks Deborah! I’m heading over to your place now! So lovely! It looks like you bought it from a high-end department store! What a fun idea Julie! It looks fabulous! 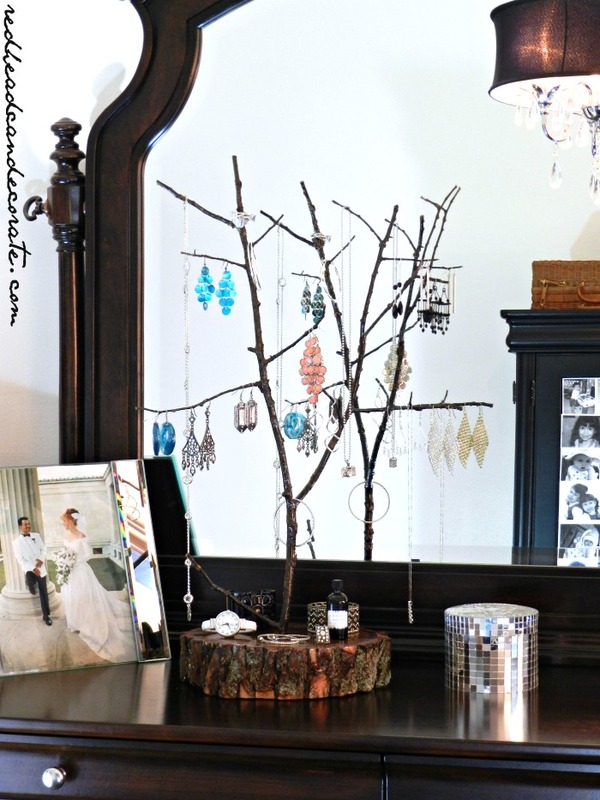 super creative idea….and I am watching housewives too. Laura did u see where they said they eat a hotdog only once or twice a year ? 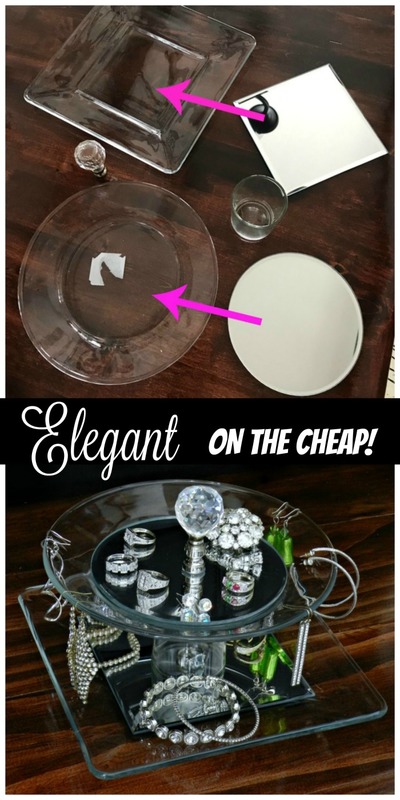 What a super easy dollar store project, with amazingly glamorous results! 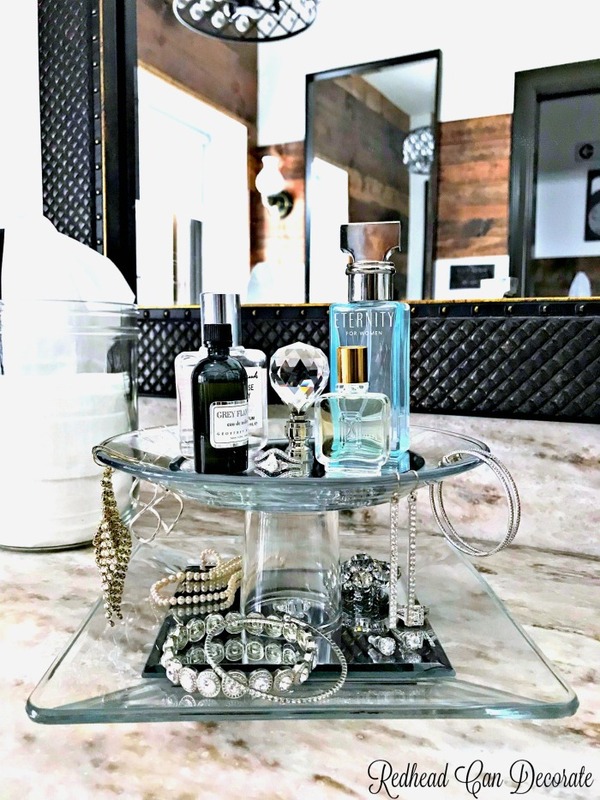 Your decor and style is definitely glam and gorgeous, Julie! I love this tray. I would make one, but, alas, my house gets so dusty so fast, it wouldn’t look nearly as pretty and shiny as it does in your home. That’s one part I’m scared of. Dusting it!! 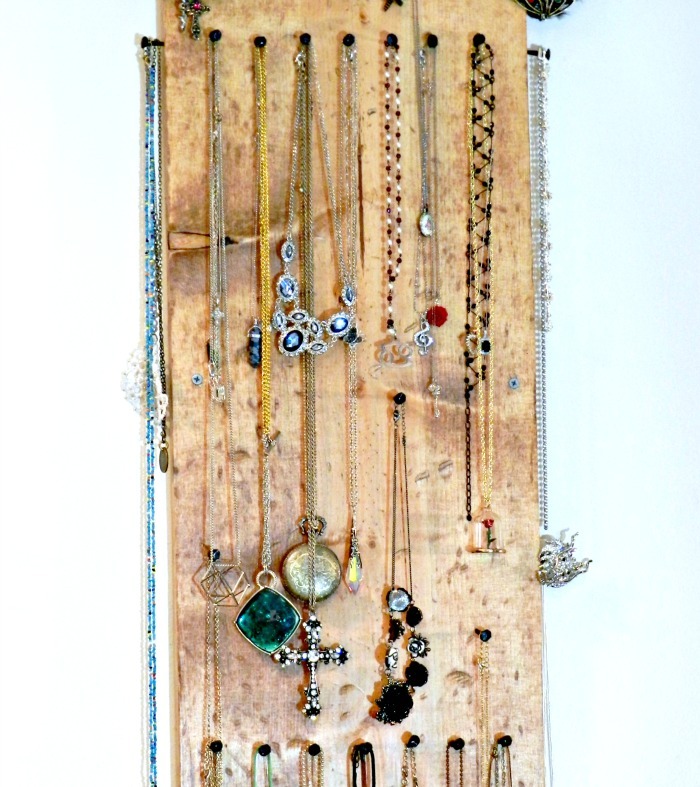 Julie I love your jewelry display and it makes me want to make one for all the jewelry that isn’t hanging in my walk in closet right now. Rings and bracelets are next on my list! It’s beautiful! Once again you have knocked it out of the park with your thrifty elegant style! Thanks for shaing, Julie. I love visiting your blog to see your many amazing ideas and recipes. I was gonna try and leave a comment all fancy like, but I don’t even know how, so I typed it with my pinky out. Know What You’re Looking For? 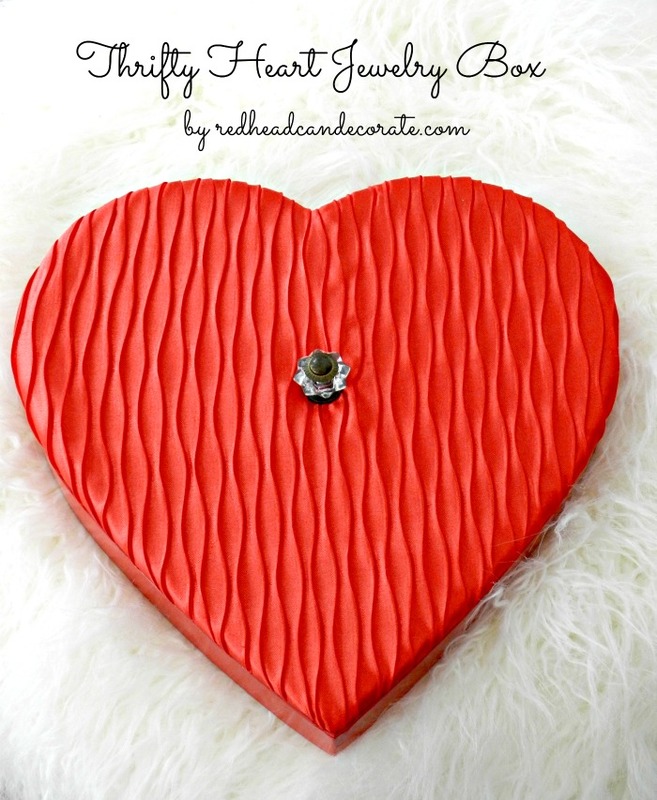 Click here to sign up for our free Redheadcandecorate.com newsletter and receive a FREE gift! Click here to sign up for the free redheadcandecorate.com newsletter and as a thank you, you will receive access to a free download of the 12 page redheadcandecorate.com home tour in Cottages & Bungalows Magazine.